In my opinion, if you’re not constantly learning something new, your brain is dying. Blogging is no different. I learn new things everyday from reading your blogs, trying to write mine and seeing the really creative things other bloggers do. Last year when I wrote this post, it was more of a ‘how to be a blogger’ type. I feel like I’ve written on that subject too much as it is, and honestly don’t really know that much more about blogging than anyone else. This year, my “what I learned” through blogging is a lot more personal. Don’t bite off more than I can chew. I love coming up with grand blogging ideas to fill this blog with fun content, motivate the community and just have fun stuff going on. That being said, I should probably think in smaller chunks. Several times this year I have found myself completely overwhelmed with my “grand blog ideas” that all of a sudden look a lot like work that I don’t want to do. There are still people I need to send hand made giveaway items to (YOU KNOW WHO YOU ARE I’M SO SORRY! I WON’T FORGET YOU I PROMISE!) and that heavily weighs on my mind. Next year, keep up the fun ideas but perhaps in smaller chunks! Forget “can’t”, because “can’t” implies that you should try. No matter what I write or how I write it, there will be people that are unhappy. I should remember to concentrate on the great support I get from the blog, friendships I’ve made and the fact that the most vocal (or sometimes hurtful) people are usually the minority. I just need to be true to myself, and write things I’m happy with. At the end of the day, that’s all that matters! I am, perhaps, too hard on myself. Perhaps. Maybe a little. I’m going to work on that. Sometimes it’s okay to be your own cheerleader. Related to the previous note, but I tend to write more about the bad than the good. When Simon is an awesome boy on the flat, it rarely merits its own post. I have always tried to be humble with my successes, and sometimes I think that may turn into it appearing that I’m always miserable. Need to try and find more balance. Last year I said content is king, which is true… but so is communication. Prompt, professional communication with other equine professionals is key if you’re wanting to make your blogging box a little bigger. This is still something I struggle with, but many retailers continue to work with me because I do my very best to do what I said I will do when I said I would do it! Sounds shocking simple, right? Storytelling is still a good thing, regardless of the subject. This year I decided to dabble a little bit more into my life outside of horses. While many days these post have lower numbers than my horsey posts, if it’s a good story (ie the Jet Ski incident) people seem to enjoy that. This makes me happy, because it means I can dip my toe back into my creative writing background and perhaps provide some more creative non-fiction pieces for the blog. Thanks 🙂 Your new blog design is looking great! I guess I have no feelings, or I’m selfish, because I don’t really care if I please everyone or if people don’t like me. That’s just life, to me. I never even occurs to me to think “is this going to make someone unhappy” when I’m writing. I think all you can do is be as honest as possible as kindly as possible, and it’s up to other people how they choose to take it. Dude, it is all the time totally fine to be your own cheerleader! Not just sometimes. And I totally agree about not learning leading to brain death. 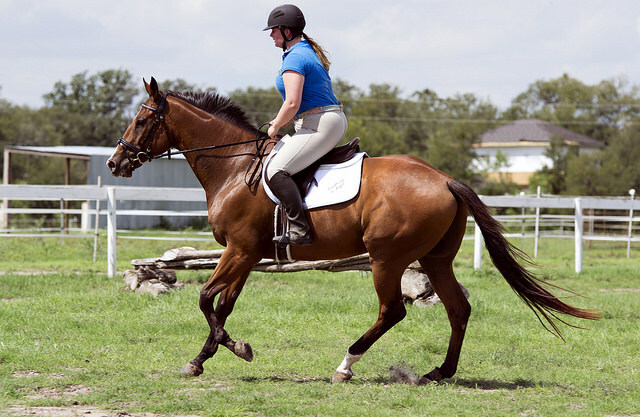 Fortunately, my horse teaches me or reminds me of some random lesson about something almost every day. Like where best to put my head while painting his hooves. Right in front of his knees is not the answer. Umm, I think that first pic in your post is my favorite pic of you and Simon! You are so balanced = textbook Eq! Love the red too! 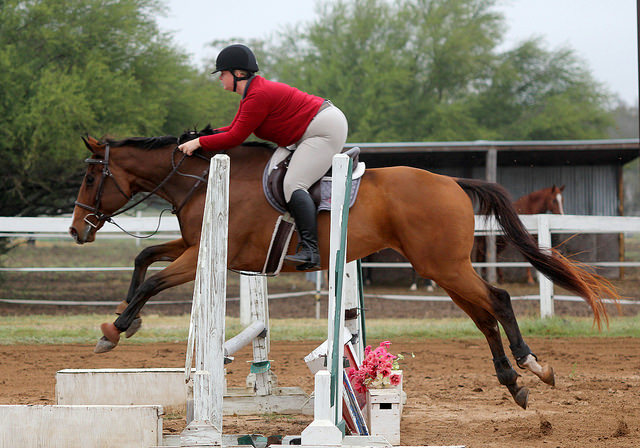 I have this belief that red sweaters make riding pictures look better regardless of what I’m actually doing with my horse. Thanks for your nice comments! Good take aways. I agree on the “be less humble” goal. I am like the least humble person ever and fairly unapologetic about it. 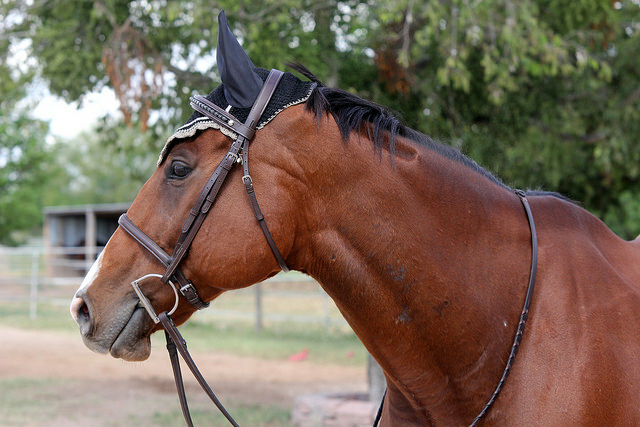 I can’t help that my horse really is cuter than everyone else’s. I’m not god’s gift to riding or horsemanship, but I blog to entertain myself. I know that costs me some in terms of readership, but I’m more interested in keeping things fun. I write every single day (except the occasional weekend when we’re out of town), so I know the feeling of having too much to do. While I love feedback and hearing from readers, increasing my traffic is not my overall goal. I choose my topics based on what I think is useful, interesting, or maybe even helpful. I try to never write about the bad stuff that happens, unless there is a positive ending, not because it’s not important, but for my mental health, I HAVE to focus on the good in life. Love your introspective look at your year! great post – and yes, totes cheer yourself on alllll the time!! my grandfather once told me that nobody will ever care more than i do about my accomplishments. that statement initially struck me as a bit strange, except i kinda own it now – and think we all should. I love your grandfather’s take on life. I filled in the survey, hope the answers help. I have to say though that I love your blog, you strike a fab balance between horse & RL updates. I love the interviews and product reviews you do and your show & training reports are always insightful. I am forever learning and thinking about things in new ways when I read blogs and yours is one of my favs. your blog is always such an inspiration to read! i’m still relatively new to all this equine stuff (as an adult) so sometimes i’m lost but you do a great job at communicating whatever it is that you’re blogging about. I loved all your posts about the cult job! Some of your non-horse topics are really entertaining. Great set of lessons. Love all your posts, but excited for new cheerleading posts too! You and Simon really rock!! I love your blog, it is a total inspiration for my own. I hope one day to have a personal blog that is as polished, and beautifully formatted as yours!